← Oh sleep. Always with the sleep. Daniel still doesn’t really talk. He is very communicative- you definitely know when he’s happy/excited/upset/frustrated. He regularly uses about 30 signs, and he is pairing more “words” with the signs every day. But he is far from understandable to anyone who doesn’t spend a LOT of time with him. However, he loves letters and can name them all. He is DESTRUCTIVE. He throws stuff, almost compulsively. He tears up books/paper/anything he can. He has broken more dishes than the rest of the kids combined. It is frustrating, to say the least. He has reached a stripping phase. We ordered some escape-proof pjs like we used to use for Kalena, and we keep him in them most of the time, because otherwise? DIAPER OFF. We still can’t let him feed himself because putting food on his high chair tray means he will either 1) shove it ALL in his mouth, or 2) throw it ALL on the floor. Mealtimes are also frustrating. 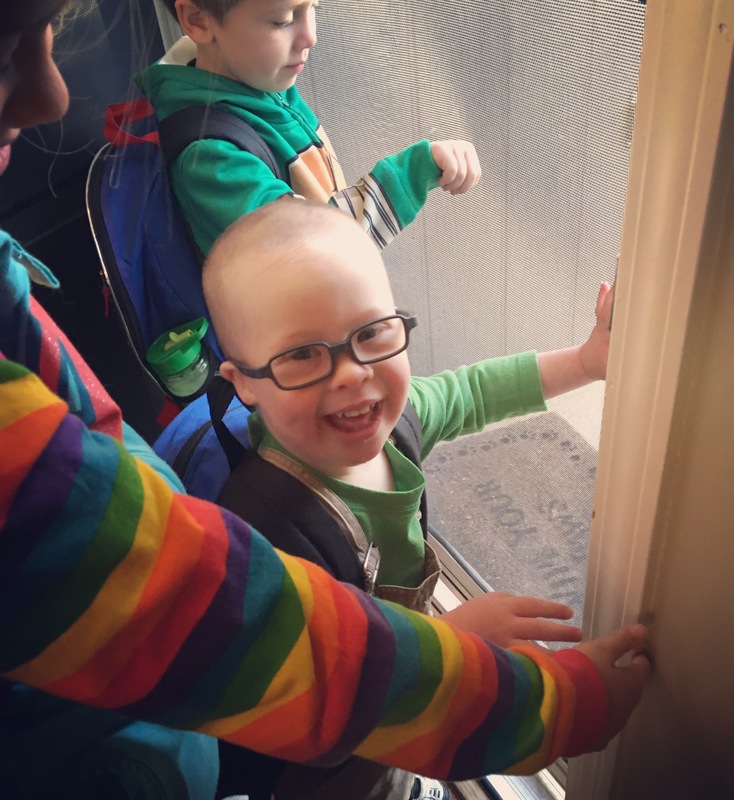 He goes to preschool 4 mornings a week, which he thinks is basically the best thing ever. Okay, maybe riding the bus to and from school is the best thing ever. He loves it all. If you follow me on Instagram you already know, DANIEL GOT GLASSES! We’ve known he’s farsighted since he was about 2, but it’s only recently gotten bad enough to make glasses worth the effort. So. What do you want to know about Down syndrome? I would like to know how you explain it to other kids? Specifically Ruby. I have not said anything. If she asks I will advise her to ask you. That is my excellent plan. I’d be interested to hear more about Daniel’s therapies. He’s in preschool–does he do anything additional? Has he aged out of EI at this point, and what did that look like, and how have they supported the transition to preschool? What kind of preschool is it? I’m a nerd and love to hear all about this stuff.